We're doing the Muskoka River X race on this river next week, so we took the day and did some recon (so as not to have a repeat of 2016's fiasco of portage hell). (1) This is not a quiet gentle river paddle. There are several waterfalls, there are rapids, and there are dams. All of these things are life-threateningly dangerous if you don't know what you are doing or where you are going!!! So while I'm giving a few notes here and some high level musings, get real maps and real guide of some sort before you set off. (2) Parts of this river are pretty remote... we're not talking Alonquin remote, but long stretches have to cottages or visible civilization. We followed the Muskoka River X gear list just to make sure we had what we needed - but that's for a race where people are looking out for you (to some degree). So do whatever you need to to make sure you have what you need and people know to look for you if you go missing (and where to look). 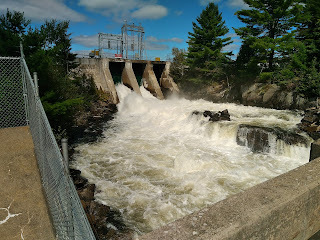 We started at the dam in Baysville, at the south end of Lake of Bays. There is a little parking lot there, very handy. About 20 seconds after we started we almost flipped - it was very close. Why? Eddies! I barely noticed them (not being a super-skilled river paddler) - and we had one on one side of the canoe... it was like the side dropped off, and there was no water under my paddle. Crazy. We encountered hundreds of them, but after that we were smarter about what to expect! I'm not going to go through every single portage - suffice to say that between Baysville and Bracebridge we portaged 11 times. You can usually hear the rushing water and it's time to start looking for the exit. The added complexity is that some are listed as Private Property, or No Trespassing. On race day they get special permission, so we had to get a little creative (sometimes with our interpretation of the law, for example). One section about 3.5km from Baysville is really fast, and there are rocks lingering below the surface. You could probably portage it, but we didn't look for a trail (since in the race we're allowed to run it!). We flipped last year on a hidden rock (left side) - so this time we stuck to the middle/right and it was great. But the water level was higher, so I'm not sure if that was just dumb luck or skill. 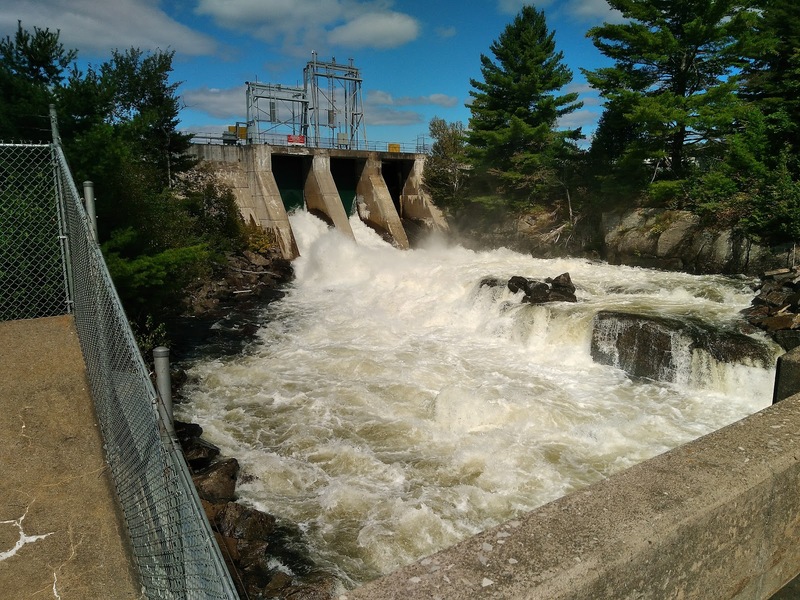 The last few portages are at hydro dams - Matthiasville, Trethewey, and the two dams at Muskoka Falls. The good thing about this section - more paddling between portages, especially before Matthiasville (almost 10km without having to portage), then almost 7km to Trethewey. We ended at Matthiasville this time, knowing the rest are pretty easy (and we didn't need that long of a day). The South Branch of the Muskoka River ultimately joins the north branch in Bracebridge. From there it's portage-free out to the lake if you continue downstream (west), or if you hang a right you can go upstream on the North Branch until you're right smack in the middle of the town. One other paddling option worth mentioning - if you go downstream to the lake, you can then hook up with the Big East River. It's portage-free all the way up for a ways - we paddled it in another area race all the way up past Highway 11. Pretty and worth checking out!